March 22, 2016 – A fleet of robotic spacecraft is exploring the Red Planet, sending back an ever-growing flood of data. While rovers like Curiosity blaze tracks through the fine Martian soil, orbiters like MAVEN and MRO circle high overhead, gazing down at the planet’s atmosphere and surface and relaying ground-based data back to Earth. The Mars fleet is providing mission controllers at NASA, the European Space Agency, and the Indian Space Research Organisation with a remote presence on Mars. 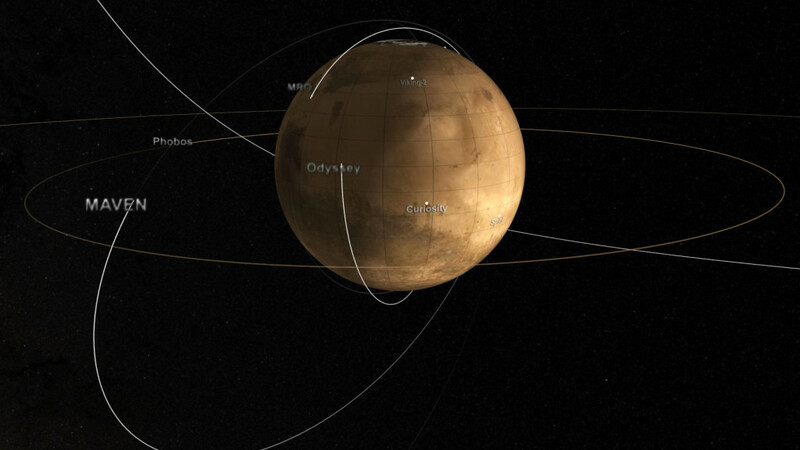 This new visualization by Greg Shirah shows the landing sites of NASA’s past and present landers and rovers; the nearly circular orbits of NASA’s Mars Odyssey and Mars Reconnaissance Orbiter; the elliptical orbits of NASA’s MAVEN satellite and ESA’s Mars Express; and the highly elliptical path of ISRO’s Mars Orbiter Mission. The orbits of Mars’ two moons, Phobos and Deimos, are also depicted.